The linear furnace is one of the industrial furnaces that Campana Forni designs and realizes, thanks to the work of technicians and qualified engineers. The treatment that is typically used in the linear furnace is the one of the annealing. Through this process it is possible to perform a thermal treatment of metals that has the main to confer resistance to the material. The annealing inside the linear furnace happens thanks to the heating inside the chamber, with temperatures that reach the 500 C degrees. The aim is to reach a softening of the surface and removing some small imperfections due to previous processes (molding, solidification etc.). A difference with the classic annealing is the structure of the oven: the linear furnace consists infact of a tape that allows to have a perpetual cycle. So, there is no need to upload a single charge, because the linear furnace is a real assembly line. The materials that undergo through the annealing process inside the linear furnace can be several. Among these we can mention stainless steel: it is no coincidence that one of the most common work is exactly the annealing of bolts and small hardware. The Campana Forni linear furnace is realized, just like the others, following the guidelines of machines legislation CE of 03/30/2017, that allowa to obtain the incentives of Industry 4.0. The annealing has the peculiarity to include the cooling inside the oven itself. Unlike the tempering, infact, the cooling is gradual and not sudden, so there’s no need for external agents in order to reach the result, such as air, oil or water. 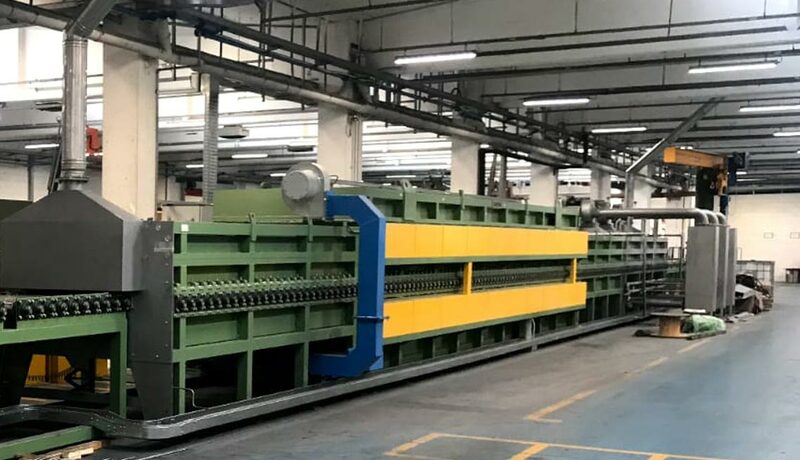 The aim of the annealing is different from the one of other processes: the purpose is not to make the material stronger, but instead making it more flexible and, at the same time, resistant. Every linear furnace made by Campana Forni is especially designed on the client needs, and realized thanks to the contributions of engineers, technicians and workers that team up in order to realize efficient and high-quality products.